I have, for years, been saying, “I don’t want a loom, I don’t want a loom, I don’t want a loom”. Everyone knows I’m lying. I say it in part because feeding a loom seems a bit daunting. Choosing a loom is even more daunting as I don’t know enough about weaving to decipher all the terms. Moreover… I might not like it. 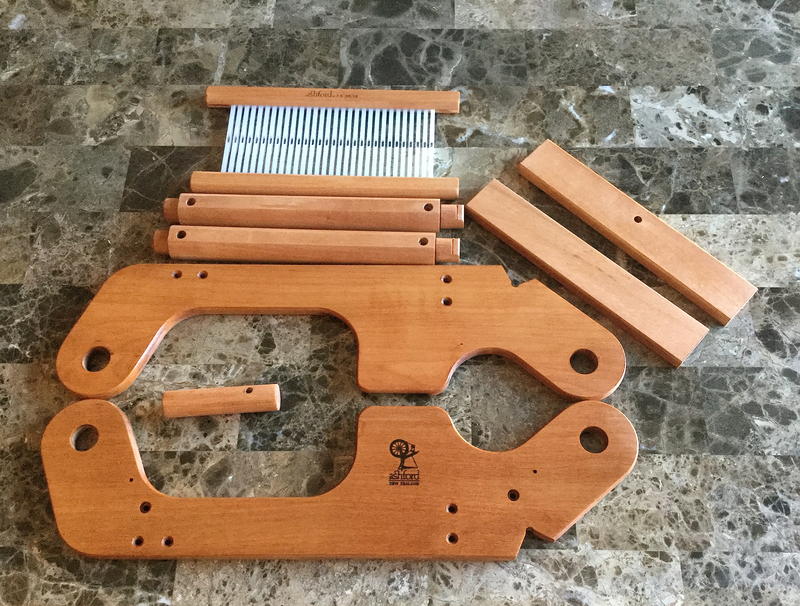 So my wife decided this Christmas to get me a small loom. 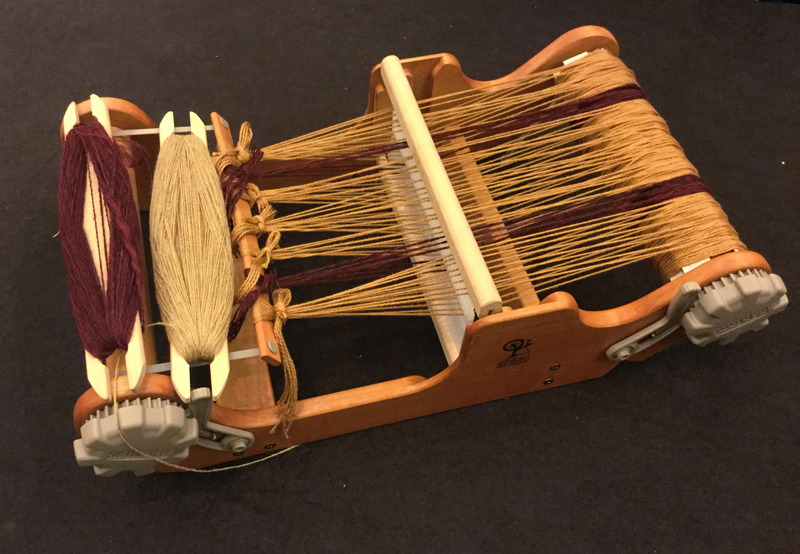 Specifically an Ashford SampleIt, which is an 8″ rigid heddle loom. It comes as kit, made from unfinished silver beech, with a single reed of 7.5 dpi (30/10cm). So it wanted to be finished. It comes with a scrap of 200 grit sandpaper. I headed to the local hardware store and bought both some 220 grit sanding foam (it has a large number of curves to smooth down) and some cherry stain danish oil. 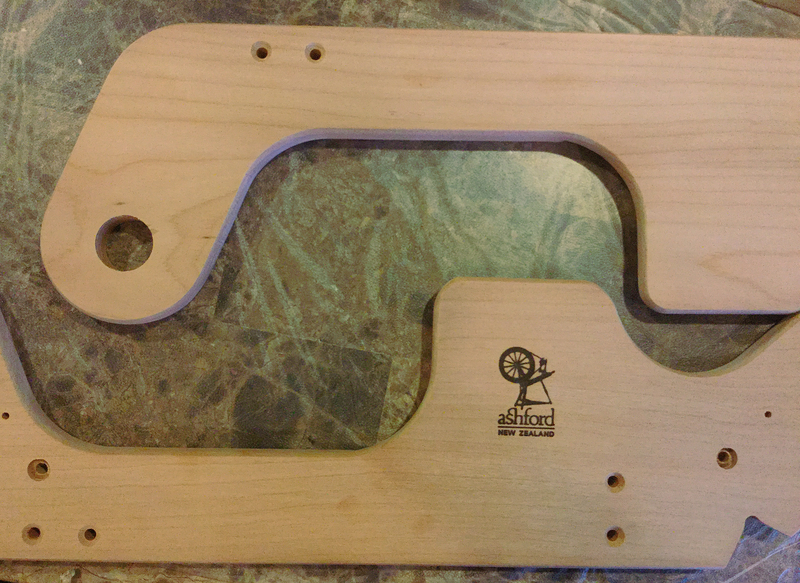 This is what the frame sides look like, out of the box. So I sanded it, and stained it (three coats) and let it rest for a couple of days. While I was doing this I was reading the instructions Ashford included. I can’t say I think they were well thought out, as they included some half a dozen different weaving patterns and a few different yarns. If one assumes the buyer to be completely new to weaving, they are complicated to the point of certain frustration. If one assumes the buyer to be an experienced weaver, they don’t need that sort of slop. On top of that, the scarf it makes is very specific. If you think it’s ugly (I do) then it’s only value is as a piece to show off what you did. And what you did is likely to be less than completely satisfying, because you have a lot more places to make mistakes. But the parts looked good when I was done. As well as reading the booklet I made posts about my thoughts on stringing it. As I had nothing which was designed for warp I thought about using some cones which were commercially spun, for commercial weaving. I was advised they weren’t ideal. So I ordered some stuff meant for warp, and two new heddles: a 10, and a 12 (40/10 and 50/10). Then I put all the pieces together. The assembly wasn’t hard. It needed one hammer, to set the pin for the pawl-restraint, and a phillip’s screwdriver. Took about twenty minutes. I can’t say I like the “Whack it hard” method of putting the pawlhead/handles on. One of them was off angle, and I had to whack it a lot more. They also might have done better to include a better inventory of the parts. I know what a wood screw is, but they also included two machine bolts, which weren’t called out well. The greatest flaw I see is the plastic tie bands to connect the two warping sticks. Those are going to fail. Well before they to I intend to use some cordage and beads to replace them, because they are ugly. The pawl handles are also a little too rounded, making it a little harder to tighten them than I’d like. That the pawls, and ratchets are plastic means they will wear out. The pawl release being friction is more nuisance than it ought to be, as the tension of the warp would be enough to retain it, and the force required to clear the release is annoying. I’m mixed on it being part of a cast plastic part. It will fail, but were it metal the failure would come sooner, or the loom would cost more (it runs about 140 USD). My string had not arrived before I needed to leave for Arisia. But my wife also has a really nice stash and offered me a cone of bronzey 3/2 mercerized cotton. I took it. Then I pulled a bit of 80/20 merino silk I’d spun up onto the nostepinne, grabbed the slightly lighter than 3/2 camel I’d been given at Christmas the year before (and not known what to do with, because I’m not a core-spinner, and it was balanced. Unless I wanted to overspin it, it was pretty much useless before I got the loom). I packed one of the new heddles (which is why it’s unstained). I chose the 10 (40/10) because I was afraid the 12 (50/10) would be more overwhelming to warp. It all went into a moderate tote bag. None of my AWOL bags were quite large enough to hold it. (gym bags? In the Army we called ’em AWOL bags, or “Ditty bags”, though “ditty” is a phonetic transcription of “didi” which is Vietnamese for “fast”. The US Army has a small collection of usages we acquired from Vietnamese, but I digress). Sadly my hotel room wasn’t possessed of any place I could clamp the loom and warping peg, so I wasn’t able to take advantage of the few hours of completely free time I had before the convention started (I work Arisia, this year I didn’t work as much as I have the past few, between Thurs. afternoon and mid-day Monday I only put in 27 hours) to get it warped. Nope, I did that in my spare time while we were setting up/testing the bouncy castles. Being something of an overachiever (or a masochist, or just foolish) I decided to make something in a simple plaid. I wanted to have some sort of challenge, as well as ending up with a scarf I could both show off, and feel like wearing. The red is wheel-spun I made. It happens to be about half the diameter of the 3/2 I was warping it next to. My advisor told me I wasn’t wrong to think I could just double the ends through the heddle to make it more even. So I have 3 ends of 2-ply laid in double after 8 ends of bronze. I kept count by laying a scrap of the two-ply 11 slots short of the far end, and when I got there just laid in three of red, then back to bronze until I ran out. Figuring out a good system to make fishing the ends through the eyes was trickier than I expected. Not only did I have to cope with the doubled ends, but as I moved across the loom the angles changed and things started to grab each other, but that’s a practice issue, and will get better in short order. Total warping time… call it an hour. Then I got to weaving. Some short time after I set up (in the lobby) a friend who 1: knew I was going to be there, and 2: is a weaver, found me and gave me some advice. As the weekend went on I got more done, as well as got lots of comment (even at a makerish sort of SF con, it’s not common to see someone wandering about with a loom under arm). I had several people ask me to show them how it was done, so I gave a short lesson. That didn’t hurt my weaving; as teaching requires one to think about what/how/why one is doing something. I didn’t want to stress myself out too much, and I knew I wasn’t going to have steady, uninterrupted, weaving time, so I eyeballed the spacing of the crossing bands on the plaid by using the position of the stripe on the take up roller (and trying to adjust for the increase in diameter as I wound on). I could have done better, but I could have done a lot worse. Having feedback (and some friendly coaching) didn’t hurt either. Late Sunday evening (about 0200, while singing in a hallway jam-session), I called it done. The longer fringe are at the head, and the shorter at the tail, of the weaving. I mis-remembered how long both the gap, and the interval to the first crossing-stripe was. Not a surprise. I need to full it. (the photo is much larger, if you want to take a closer look at the weave itself). As predicted by my friend, there were some issues with tension differential between the two yarns. I also had some issues with managing tension when rolling cloth up to make room in the weaving space. I needed to have less yarn on the shuttle. That’s because I was afraid of running out. I need to work on the russian joins I was using to lay in my color changes. I want a second heddle. I’d like to find a way to tweak this loom to have means to control the tension on two different fibers (Ashford makes such a thing for other models of loom). I’d like to shave off some of the back slope on the channel for placing the heddle into neutral. It’s too tall, which meant I had a hard time getting the heddle out of it (in wasn’t too hard, unless I’d woven too close to the heddle) and that I usually chose to just move the heddle toward me when I was rolling on. I don’t like the pawls. They are fussy about release, iffy about locking down securely (which would be less of a problem if the friction lock weren’t there), and were pretty much the worst part of the experience. Part of why I let my work get so close to the heddle face so often was to avoid messing with the pawls. But it was fun. I only made a few errors (crossing over threads I meant to go under) a few times without catching it before I was unwilling to pull a Penelope and undo my work. Next I want to work out twill, so I can get prettier plaids. Then maybe some checks, or log-cabin, for some variety. I may also work on warping up without the heddle and treat it as a card-loom. There are so many possibilities. Excellent! 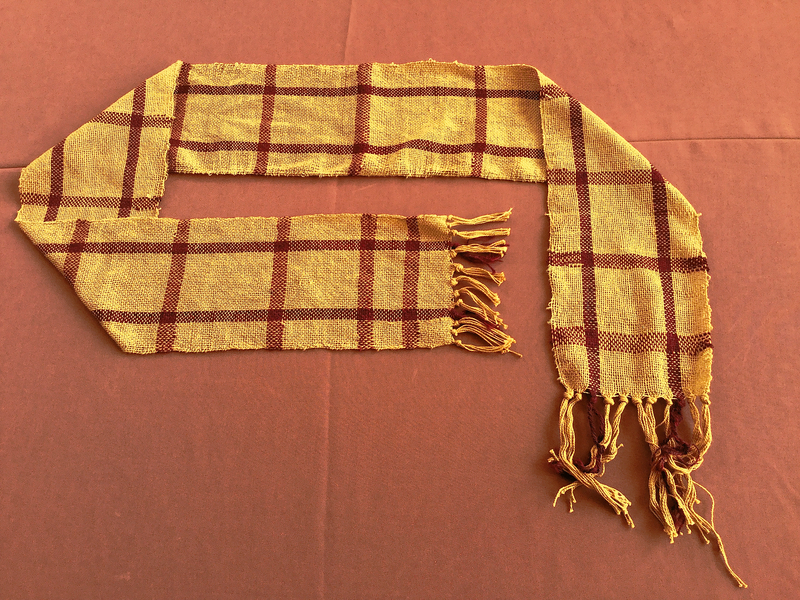 That’s a lovely scarf, and even more so as a first piece. You don’t need Russian joins: you can just overlap the weft ends within a pick and trim the emerging bits out later. I’m not sure that would work well as a card loom, since it’s awfully short. You only (or mainly) know me from Twitter, where I mostly talk about SFF, so you may not know that card weaving is my man thing: http://www.stringpage.com. Sisuile was saying she has one of about that size, which she uses that way. 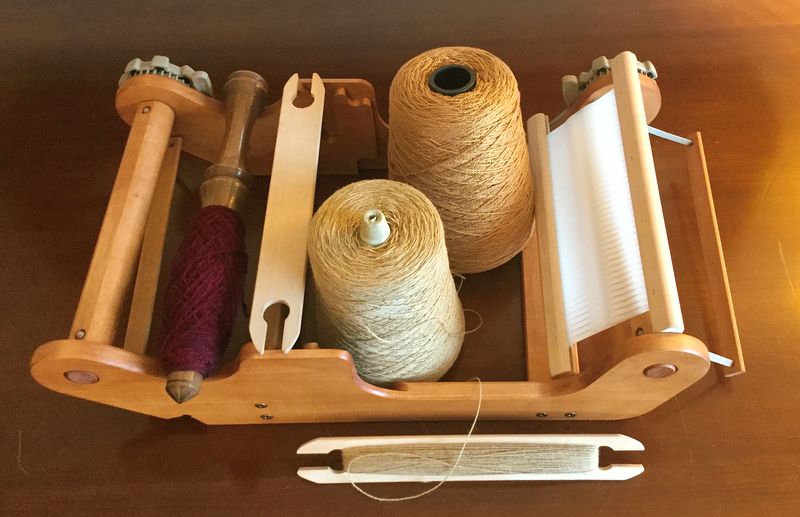 I’m also going to have an inkle loom in the next three weeks or so, a friend isn’t using it, expects to never use it. It’s possible, but not ideal. 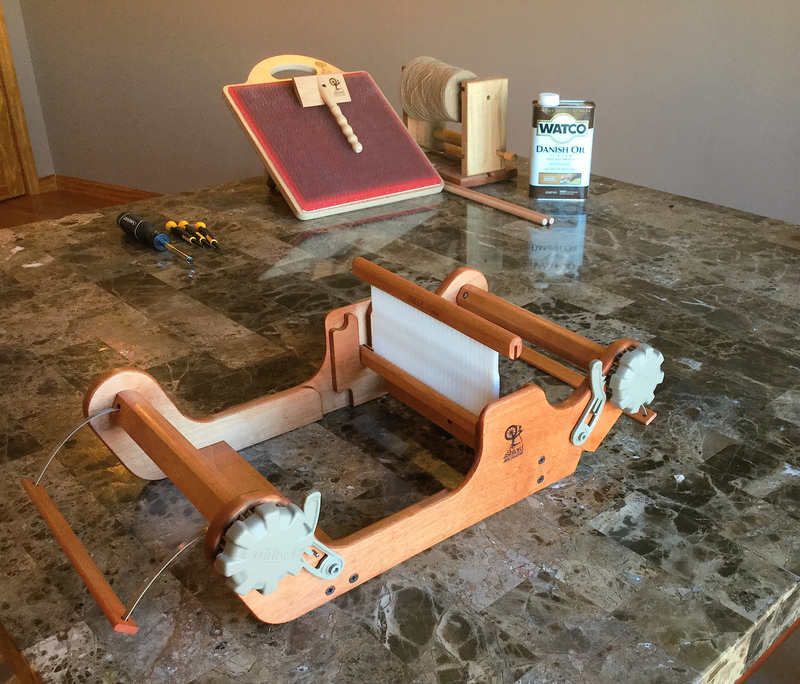 Lots of people like inkle looms; I am not one of them. I will know soon enough if I like inkle. If not, away it goes. I think (at least it feels that way) you are familiar from Making Light, but that’s also a skewed subject area. That was the “mainly,” since I’m not very active there so wasn’t sure you’d remember me. And yes, also not a place where I enthuse at length over fiber arts.